I have a need for an old-fashioned FTP with no security on it. The files that I upload will already be encrypted. Even a decrypted file would be useless to just about anyone who might obtain one. Is this service offered? I want to qualify what I posted earlier. I want to be able to manage the files with a secure link but I want to be able to create an account that can only read files and is not allowed to upload or modify the files in the account. The user access to this account would have no security on the FTP port but the management account (my account) will have security on it. What I don't want is for a user who downloads a file to have the file under his control. The files will only be downloaded via some automated software. The only security on the user account is UserName/Password. If I understand correctly, you want a plain FTP service with 2 user accounts, one is the admin user, the other one is the guest user. 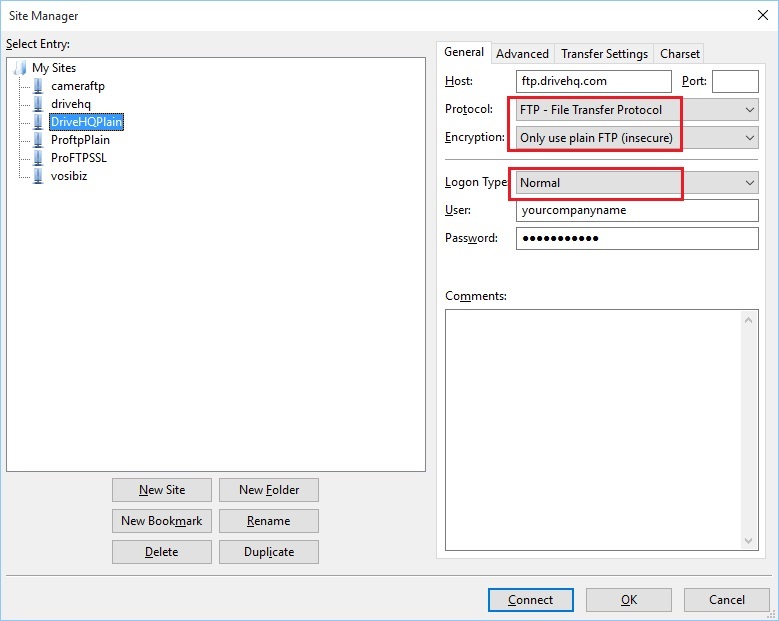 The admin user will have full access to your files using the plain FTP protocol; ther guest user can download files, but cannot modify or delete files. This is a very basic feature of our FTP / cloud IT service. You just need to sign up an account on DriveHQ (which you have done so), you can then access our FTP hosting service at ftp.drivehq.com. To create a sub-account, please make sure you use our Group Account service. From the DriveHQ start menu, click on Group Account to access our group account features. You can create / manage sub-accounts from there. Now you just need to create a folder in your main account. When you log on as your Group Admin account, you will have full access to all files in your account. 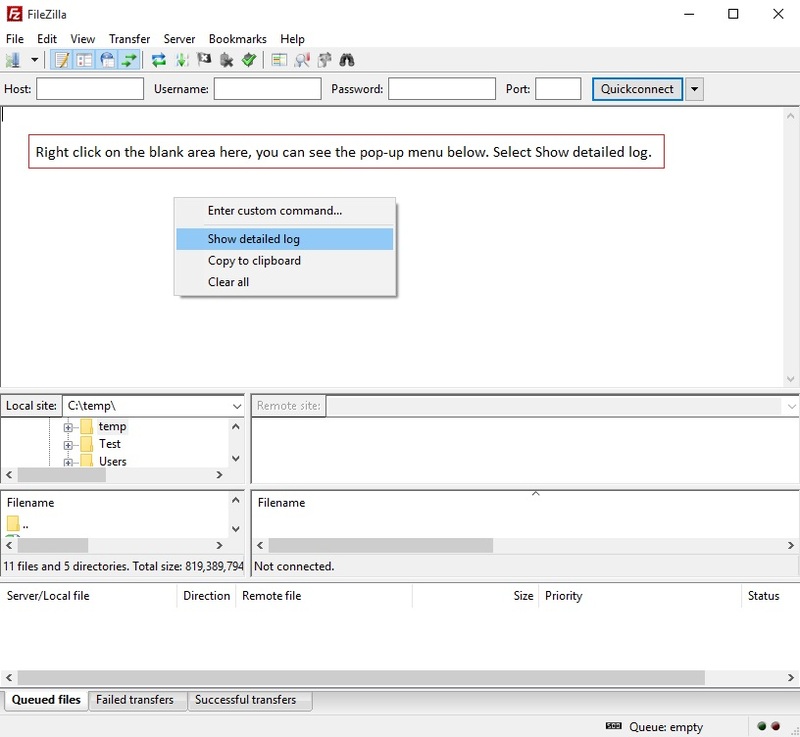 If the folder is shared with read-only permission, then the sub-user cannot make any changes to it. Please let us know if this answers your questions. I think this answers my question. I basically want no SSL on the FTP port. It is too much to ask at this stage. I see. Plain FTP is considered insecure nowadays. DriveHQ supports FTP over SSL. However, plain FTP is still supported. However, I then send it the NAME command and there is no reply. Sending it the PASS command also results in no reply. Connecting with FileZilla results in a TLS connection. It looks like there is security on the FTP port and I can't reach it with plain old FTP. Perhaps FileZilla is offering TLS as a connection option and your server is choosing it. But your server is not responding to any standard FPT commands except the initial connect. Could it be that standard FTP is on a different port? Usually we recommend the group account soultion in this case. If this is not what you want, my recommendation is to conact support@drivehq.com for more detailed information and solutions. I was using what I believed your group account to be. At the main page I selected "GROUP ACCOUNT" from my user name dropdown at the top of the page. I created a subaccount. After successfully connecting, I send the user name with the FTP USER command and got no reply. Plain FTP should be very straight-forward. If it does not work, usually it means your firewall / router has blocked FTP. In this case, please use FileZilla to test it from multiple locations. Enter the server name: ftp.drivehq.com, or if you have a paid account, you can also use proftp.drivehq.com. By default, it uses FTP over SSL. If you want plain FTP, please change Encryption to "Plain FTP" as shown above. Click Ok to save the site; click Connect to connect to our FTP server. If my firewall were blocking the FTP port then I would not have been able to connect successfully. I have tested using FileZilla and it connects successfully with TLS security. So the my firewall is not blocking FTP. I followed your directions and I obtained the results I was looking for using FileZilla. Your directions have been very informative and I appreciate the help. But for some reason, I am only getting the welcome message and not the other messages that the detailed log shows when using my software. But this milestone should get me on the right track. You have been a lot of help. I will study my code and will, hopefully, see the error of my ways. 220-You are user number 5 of 50 allowed. 220-Local time is now 13:14. Server port: 21. Response: 331 User name ok, need password. Response: 230 User lJzpGw3vWfwT logged on. Free service has restrictions and is slower. Response: 200 Enable UTF8 mode. Have you also tried with the command-line FTP? If not, please do so and send a screenshot. If FileZilla and the command-line FTP work fine, but not your program, (also considering our FTP service has been around for over a decade), I believe it is caused by a bug in your code. There are many free FTP client codes and libraries you can use instead of directly programming Sockets. (1) Your account was blocked. But if you can connect via FileZilla, then your account is (was) not blocked. FYI, free accounts are limited to log on 25 times per day. Anyway, you might want to try with a different account. (You can test with your Group main account), or you can order our monthly service. If this is for an enterprise account (project), please call our support line. We will have a senior engineer to help you, even though it is not a DriveHQ FTP server issue. The command line FTP does not explicitly show the messages that are being passed between the two systems. Because of this it is not of much use in diagnosing this problem. When I open a connection it prompts me for a user name which is not something that the FTP server is doing.